Booming Bend, in central Oregon, has been helped along by low costs of living, cheap real estate, gorgeous scenery and lots of sunshine. Despite its rapid growth in recent years and increasing attention from tourists, Bend has retained its charm. The town has grown up around the banks of the mighty Deschutes River, close to both the deep green rainforests of the Cascade Mountains and the western Oregon desert. Mountains like Mount Bachelor and the Three Sisters volcanoes provide the backdrop here. There is plenty to love about Bend, from its charming downtown to its proximity to myriad outdoor opportunities, making it the perfect place to book a vacation rental any time of the year. There is more than enough to do in Bend to keep you busy for several days. Old Bend is crammed with art galleries, shops, cafes and restaurants, with pretty Drake Park along the Deschutes River as a centerpiece. Craft beer lovers will delight in the local breweries like Bend Brewing Company, Silver Moon Brewing and Deschutes Brewery. In summer, Bend's Summer Music Festival brings classical music to town each August. And don't forget to visit the High Desert Museum, an excellent place to learn about the geologic and cultural history of the area. 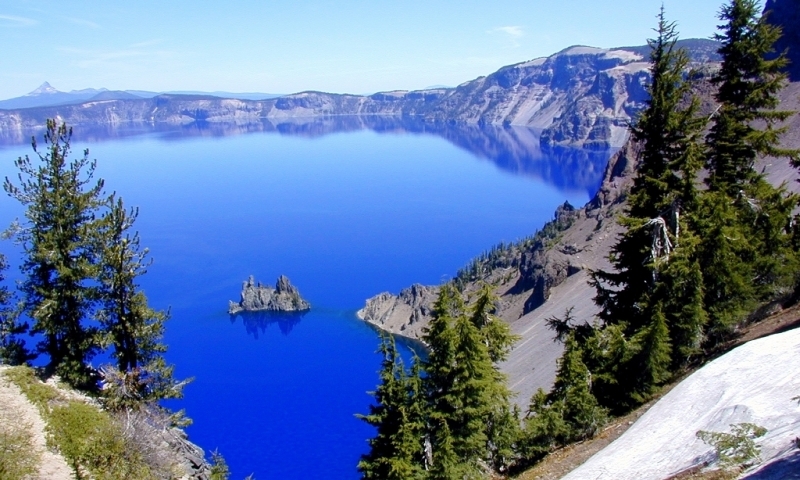 Just less than three hours south of Bend is Crater Lake National Park, where a deep blue lake sits in the crater of an extinct volcano. The lake is surrounded by steep cliffs that rise to 2,000 feet and stay snow-covered into mid-summer. In fact, the roads to the lake are often closed until spring, so it is best to check with the National Park Service before you go. The park service offers interpretive walks around the lake to help you learn the geology of the area. The Painted Hills of Central Oregon are a lesser-known natural area, just two hours outside of Bend. This bizarre Martian landscape of rolling red and orange hills was formed when the area was a river floodplain. Now, roads wind through the scenic area and boardwalk trails offer leisurely walks and great photo opportunities. Bend's outdoor offerings are almost overwhelming, and the options are great any time of year. In winter, nearby Mount Bachelor offers some of the best skiing and snowboarding in the Northwest. The runs are just 22 miles from town, so it is easy to plan a ski trip from your vacation rental. A shuttle operates from downtown, too. Or try a different way to take in the snow at Mount Bachelor - dogsled rides, which last one hour and include a tutorial on dog sledding. Hikers will love exploring the Three Sisters Wilderness volcanic area in summer. When the snow has melted, Bend's famous 300 days of sunshine make this area even more beautiful. There are also plenty of opportunities for white water rafting or kayaking on the Deschutes River; guide companies in town offer half, full, and multi-day trips on this scenic river. About HomeAway.com: HomeAway.com offers a great selection of Bend vacation rentals including cabins, homes and condos. Consider staying in Bend or anywhere in central Oregon for you next vacation.